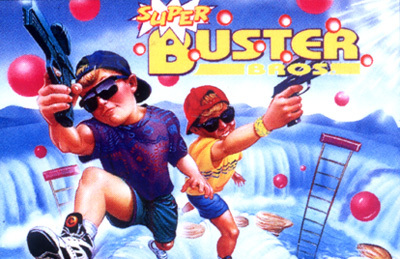 Although the Super Buster Bros. arcade game allowed two players to play simultaneously, the Super Nintendo version has only one player mode. The object of the game is to use your gun to pop bubbles that bounce around your screen. There are two different modes in this game: Panic Mode or Arcade Mode. When a player pops a bubble, it splits into two smaller bubbles. This happens repeatedly, but eventually, the bubbles get so small that they pop when shot. Occasionally, monsters will walk or fly on to the screen, these can be seen as a help or harm to the player. When the player touches a monster, they die, but monsters can pop bubbles. There are several powerups that can be found throughout the game. These are found by either popping certain bubbles, shooting boxes, or shooting certain spots in the level that are not marked.